Having hogged the headlines throughout the last Paris men's fashion week, Louis Vuitton's streetwear supremo Virgil Abloh attempted to repeat the trick Wednesday by giving the suit and tie a millennial makeover. Having set Instagram alight by sending out Michael Jackson-style sparkly white gloves as invitations for his Louis Vuitton show Thursday, the American designer took his scissors to the business suit in his own Off-White label show. With the rappers Offset and Playboi Carti on the catwalk modelling massive puffer coats, and a further posse of hip hop stars on the front row, the only African-American in charge of a big brand set out to prove that there was more to him that street culture. "I zig while I zag," the one-time architect, civil engineer, DJ, artist and all-round renaissance man told reporters afterwards. "If you look at how I am depicted, I am always the streetwear guy, but that is only part of the surface level. In culture you are supposed to lead," Abloh added. The show in the courtyard of the Louvre museum was one of the hottest tickets of the week. Set in an overgrown post-industrial wilderness, a gentle waft of hashish floated on the air. As well as his reimagined "authoritarian business suits" inspired by television newscasters from Abloh's youth in the "time before Instagram", several of his models wore American football helmets. 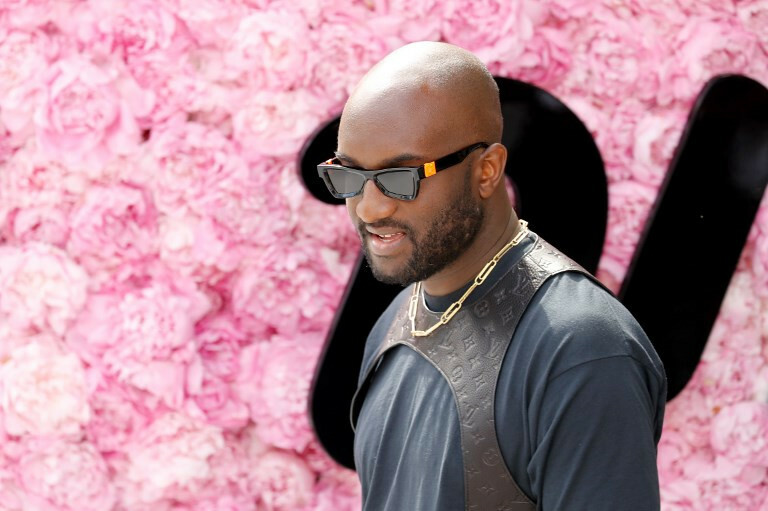 Abloh -- whose magpie imagination has set fashion alight in recent years -- also treated his 3.4 million social media followers to a preview of his new jewelry line, inspired by the humble paper clip. He also wrote a poem for his Jackson-inspired Vuitton show, his first "outside of a high-school homework assignment a million years ago", the 38-year-old said. With his friend, former collaborator and fellow black American Heron Preston kicking off Paris fashion week, Abloh told reporters that it sometimes felt that their moment had come. Both are close to the rapper Kanye West, who long dreamed of leading a major fashion label himself before Abloh got their first by taking the helm at Vuitton last year. Abloh will be subject of a major retrospective exhibition at the Museum of Contemporary Art in Chicago in June. Elsewhere on the second day of the Paris men's shows, black was also the dominant color on the autumn-winter catwalks, with Givenchy, Valentino and OAMC all opting for a relatively sombre palate. One of the big exceptions was the Japanese youth label Undercover, whose designer Jun Takahashi mixed ski wear, Venetian ball masks and the swagger of Highland Jacobite rebels with plumed bonnets in his show. But it was Belgian maverick Walter Van Beirendonck who really turned up the chromatic temperature with his fabulously multi-colored acid-trip looks that seemed to have escaped from an alien anthropological museum. His sharks' teeth sneakers were also clear winners of the day's snappiest shoes. Another Flemish legend Raf Simons rounded the day off, with his first show since he parted ways with New York brand Calvin Klein last month.